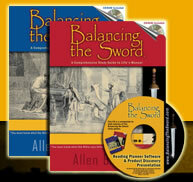 Balancing the Sword has enjoyed warm reception from Christians across the denominational spectrum. Significant enthusiasm for BTS springs from homeschooling parents. Why? Homeschooling parents are characteristically known for being very intentional and consistent in discipling their children in the teachings of Christ. It's my pleasure to provide you-all with the following list of home-education organizations. The provinces of Canada (CA) also have homeschooling organizations.